Over the past couple of years, there’s been plenty of drama concerning rideshare in Texas. While cruise passengers loved the services because they offered a cheap ride to the cruise port from Houston, cities imposed regulations on the services. The result of those city rules was that both Uber and Lyft pulled out of the Galveston market and Lyft left Houston as well. This meant cruise passengers had to find alternate (and usually more expensive) ways to get from Houston to the Galveston cruise port. Following recent statewide legislation, rideshare companies operating in Texas are regulated on the state level instead of the local level. That means there is no longer a patchwork of rules for them to follow, depending on the city. Following the passing of the legislation, Uber and Lyft have come back into many Texas cities. Austin may have received the most fanfare when the companies came back, but more quietly Lyft returned to Houston and both companies returned the Galveston. That’s great news for cruisers living or flying into the Houston area. Uber and Lyft offer affordable transportation to the cruise port, typically at a sharp discount to taxi cabs or shuttle services if you travel with a family or group. Estimated fares for Uber and Lyft are $42-56 from Houston Hobby to the cruise port each way. The estimated cost is $73-96 for a ride from Bush Intercontinental to the Galveston port. Keep in mind that fare is for the car, not per person like many other shuttle services. Up to four people can ride for that price. So a family of four flying into Houston Hobby would spend about $80-110 roundtrip for a ride to/from the cruise port, compared to $240 for the cheapest shuttle service. Having more options — and cheaper ways — to get to the cruise port is a great thing. Getting from the airport to the cruise ship is without a doubt the biggest hassle of cruising from Galveston. This should make it easier and attract more passengers to the island. 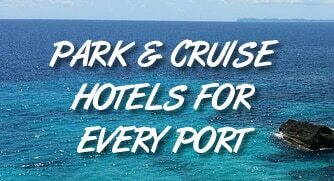 For more on using these services to get to the cruise port, visit our page on port transportation. 9:00 AM, we are going to return on August the 4th around Noon time from Galveston, remember we have lugage , return to IAH to take the plane back home, can you please give the best opcion and price???????? What is the typical wait time for uber/lyft from port to IAH airport, if it is a busy time with a ship docking and others using these services around the same time? What could I expect the longest wait to be? We’re not sure on that, but we wouldn’t expect it to be too long. If it is, try walking a couple of blocks to where there is less of a crowd.